In addition to general and cosmetic dentistry, Dental Associates of Delaware’s Brandywine (Wilmington, DE) office also provides treatment for patients who suffer from snoring and obstructive sleep apnea, or OSA. Do you snore loudly or wake up breathless in the middle of the night? Are you tired and drowsy during the day for no reason? If you are experiencing any of these symptoms, you may benefit from the sleep apnea and snoring treatments that Dr. Richard Carroccia offers at our Wilmington / Brandywine office. Dr. Carroccia has been trained in repositioning the jaw to help the patient breathe better and easier. Dr Carroccia works closely with other specialists such as pulmonologists and ENTs. This team effort helps the patients who suffer from sleep apnea sleep soundly and healthy again. Sleep Apnea affects nearly the same number of people as does asthma and diabetes. Unlike those other conditions it usually goes undiagnosed and worse, untreated. Sleep Apnea affects not only the quantity of sleep, but the quality of sleep. Poor sleep can lead to a host of concerns such as daytime fatigue and irritability; it can contribute to high blood pressure and other health risks. Sleep apnea is actually the inability to breathe during sleep. This puts the body in a “shock” mode where it can put stresses on other body systems such as the heart. If you are experiencing any of these symptoms, contact our office for a consultation. For some people, simple changes to the daily lifestyle like losing weight, developing better sleeping habits, avoiding alcohol or sleep medications at bedtime can cure and prevent sleep apnea. 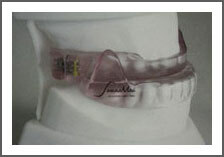 However, other people might require the use of an oral appliance such as a snore guard. Dr. Carroccia will work with you to develop the best form of treatment. 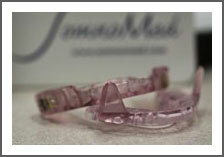 Our custom snore guards are similar to athletic mouth guards, but are worn while sleeping. They hold the lower jaw in a forward position to prevent it from falling open in the middle of the night, causing the airway to become blocked. The snore guard will create and maintain a clear airway to reduce snoring, improve breathing and reduce the health risks associated with sleep apnea. Contact our Brandywine / Wilmington, DE dental office today if you believe that you or a loved one is currently suffering from obstructive sleep apnea or is displaying any of the symptoms described above. Please feel free to contact us if you have any questions at all or would like to schedule an appointment! Thank you for the good night sleep that I forgot was even possible. I had become accustom to waking up tired, going through my day groggy, being painfully tired by 7:00 in the evening, and waking up three to four times a night. The SomnoDent appliance has literally changed my life. After the first night using it, I woke up much more alert and clear-headed. I smiled! After a few weeks, I was driving down the road and it occurred to me I wasn’t drowsy. I smiled! After dinner, I was reading and thought, “What a difference – that ‘painfully tired’ feeling was gone.” I smiled! But the best change of all was that I was able to sleep through the night getting up only once and sometimes not at all. I spent several years trying to use the sleep apnea machine. I could not get comfortable. A few hours into the night, I would wake up and rip it off. The SomnoDent appliance is much less obtrusive and does not disturb me at all. I had forgotten how valuable a good night’s rest was to my well-being. I feel like this is the first step towards a healthier life for me. I sincerely thank you and your staff. You are knowledgeable, informative, and caring. You made the process painless and productive. My doctor said, “It’s important to breath at night.” That’s the simple truth.